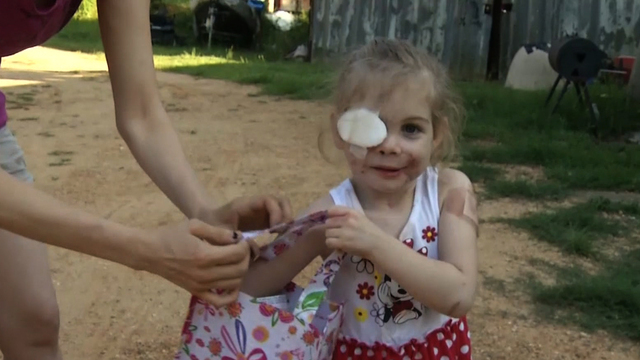 The family of a Mississippi toddler who suffered serious injuries when she was attacked by pit bulls have turned down a donation from KFC toward her injuries, despite their accusations that an employee of the company asked her to leave one of their restaurants because he scars were disturbing other customers. "We didn't feel it was appropriate to accept it after everything KFC has done," Bill Kellum, attorney for 3-year-old Victoria Wilcher's family told the Jackson Clarion-Ledger. Victoria was attacked in April while visting with her grandfather Donald Mullins. In the incident, the girl lost an eye and had several wounds to her face and body, which require extensive reconstructive surgery. Mullins says he killed the dogs, which he said also attacked him and his girlfriend Rita Tompkins. The two were charged with child endangerment and face a grand jury in September. The girl's grandmother, Kelly Mullins, who is estranged from the grandfather, claimed on a Facebook page entitled "Victoria's Victories" that the two were asked to leave a Jackson, Miss., KFC by a worker there due to her disfigurement. The page, which followed her journey since the attack has been taken down. But the family has solicited donations toward Victoria's recovery and Kellum says the fast food chain would be better off donating to a surgeon who has committed to helping the girl. However, the Laurel Leader-Call reported that a KFC investigation of the incident determined that there is no evidence that shows Victoria and her grandmother were ever asked to leave the restaurant. A statement from the company posted on the newspaper's website says KFC will still honor their intention to donate the $30,000. Kellum has decried that story and says that Mullins insists the incident did happen. "With everything that's happened, we just didn't feel right about accepting their money," said Kellum. "But we did tell them they were more than welcome to donate the money to the Frank Stile Foundation." The Frank L. Stile Foundation is a non-profit formed by the Las Vegas plastic surgeon to help needy children. Stile has pledged to do the needed surgery for Victoria and has dedicated a portion of his website to soliciting donations for the operations. Kellum also said that GoFundMe.com will release more than $100,000 to go towards Victoria's recovery. But CBS affiliate WJTV in Jackson said the crowdfunding site is withholding that money until there is more clarity in the situation.